22yrs old youth was killed, 3 PAC jawans and more than dozens were injured in Bareilly, in clash between a group of Kanwarias and local residents on Sunday night. The ADG (law and order) Jagmohan yadav went to Bareilly himself with IG on late Sunday night to know about the situation. Clash began when a group of kanwariyas coming back from Brahmapura with Ganga jal, coz they were going to shiv mandir to offer gangajal to lord Mahesh on Monday in Sawan, month of Lord shiva. They were playing ‘Dj music’ and going from the Shahadat area, where some people of shahadat area’s objected for the music sounds, coz they were offering their Ramzan prayer at nearby locality, the arguments started between both communications and then clash happened from both side. 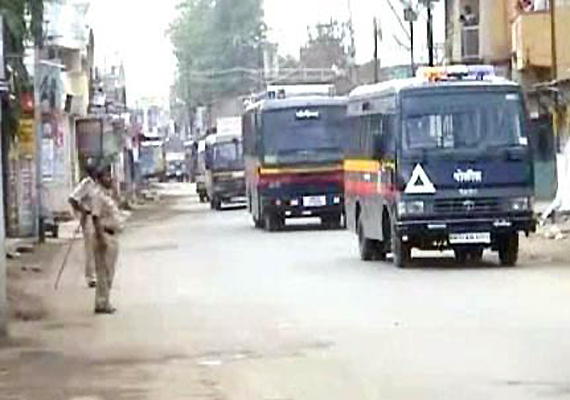 They started fighting, two groups exchanged fire, situations turned in violence and clash continued till police reached at place with PAC jawans and controls the situations. More than 12 shops and 15 vehicles damaged in the heavy brick-batting. Now situation is under control, curfew imposed from Sunday night but city still remains in under tense, keep patrolling by police.